Lloyd's Electronics, Inc., Compton, California, U.S.A.
A subsidiary of Rockwell, Lloyd's, also known for its stereo equipment, introduced a wide range of models of electronic hand-held calculators in the early to mid- 1970s, including the Lloyd's Accumatic 100 which was probably the first calculator with an LCD display. 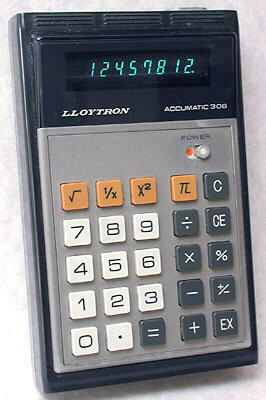 In Europe calculators identical to Lloyd's models are found with the name Lloytron. 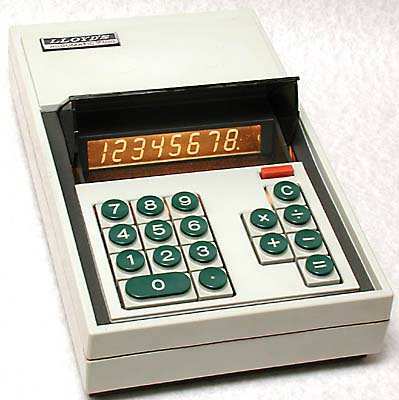 Launched in 1972, this model was probably the first successful calculator with an LCD display. It uses a reflective type display, and requires a filament lamp to illuminate it. It was also sold under the Sears name. 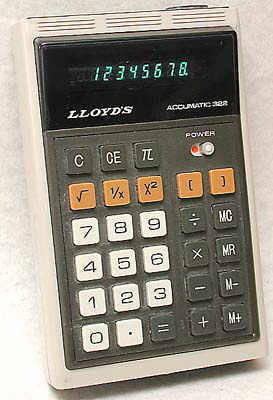 A typical Lloyd's hand-held calculator. There was a wide range of rather similar models, and in Europe they are often found under the Lloytron label. One of the calculators sold in Europe under the Lloytron label. For further photographs of Lloyds calculators see the Calculator Photo Library on this site. Milton, R., Beaumont, A.J. (1974), Electronic Calculator Markets and Suppliers, 2nd. ed., Finresearch Series, London: Ovum, 71.